The World No. 1 leaves adidas to join Nike. News that two-time Grand Slam champion and current World No. 1 Naomi Osaka had left Adidas to join Nike’s elite roster of women’s and men’s tennis professionals broke Thursday night while the two-time Grand Slam champion was meeting NBA superstar LeBron James of the Los Angeles Lakers – a fellow Nike athlete – at Staples Center, and by Friday morning, it was splashed across the top of the WTA’s website while going viral on social media. Make no mistake, thanks to winning consecutive Grand Slams at the U.S. Open last September and the Australian Open in January – and ascending to No. 1 in the rankings – Osaka has become a global phenomenon, and she’ll continue to build upon her earnings potential with her new Nike clothing sponsorship. Osaka’s coming out for Nike included courtside seats at Thursday night’s Los Angeles Lakers-Golden State Warriors NBA pro basketball game, where in addition to meeting James, she also shared pre-game pleasantries with all-stars and Nike ambassadors Kevin Durant and Draymond Green of the Warriors. She tweeted photos of her with all three basketball stars attired in a stylish black Nike top that prominently revealed a white Nike swoosh across her chest. Also, Osaka wore a pair of casual, multi-colored Nike sneakers. After all, it’s never too early to promote the new brand. Terms of Osaka’s deal with Oregon-based Nike, which began April 4, were not disclosed. However, according to the Times of London, as reported by Bloomberg News, the winning bidder for Osaka’s clothing deal was expected to pay about $8.5 million (U.S. dollars). 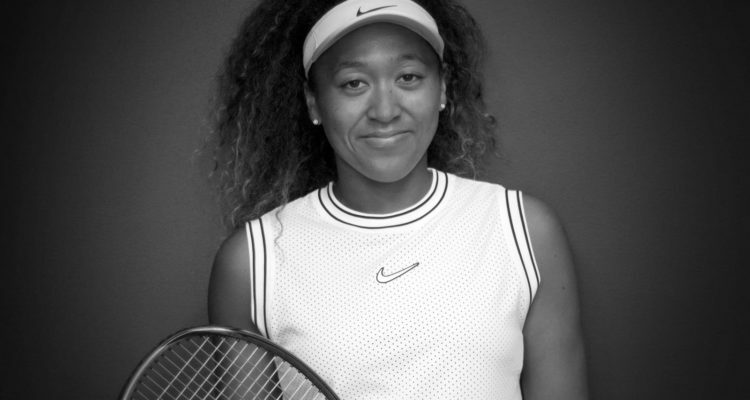 On Friday, New York Times tennis correspondent Ben Rothenberg tweeted confirmation from Osaka’s agent, Stuart Duguid, that Osaka “will continue to wear her sponsor patches (Nissan, ANA) even after switching to Nike, which normally does not allow its athletes to put patches on Nike clothes.” According to Japanese press, as reported by Forbes, Osaka passed on other offers that included Uniqlo. Osaka wore Adidas attire as recently as the Miami Open two weeks ago after her original contracted expired at the end of 2018. Now, she will don Nike gear for her first official competition at the WTA’s Porsche Grand Prix in Stuttgart, Germany, which begins April 22. Osaka joins a host of other Nike top women’s tennis stars including: Serena Williams, Simona Halep, Petra Kvitova, Elina Svitolina, Sloane Stephens, Madison Keys and Maria Sharapova. She will also wear NikeCourt Zoom Zero tennis shoes on the court. This entry was posted in WTA Tour News and tagged Naomi Osaka, Nike.